WAIT…Your Order Is Not Complete! Would you like to accelerate your results, and get back to pain-free shoulders MUCH FASTER? These 3 DVDs, which you can get for FREE, can help you do just that. 50 Filler Exercises DVD Program – This unique program gives you 50 different exercises that ACCELERATE THE RESULTS of any workout routine or injury recovery program you’re doing. My clients have used these to increase and speed up their results with many of my programs! 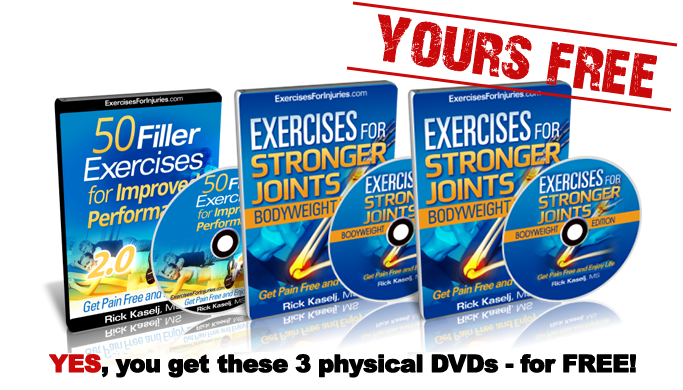 [2 DVD SET] Exercises for Stronger Joints Program – When your joints are stronger, every workout you do will be more effective and more efficient, which helps you recover from injuries faster and eliminate your pain faster. This Stronger Joints program will support everything you'll be doing in the Shoulder Pain Solved program, and may even accelerate your results, getting you to pain-free shoulders even faster! FREE INSTANT ACCESS to my VIP-ONLY “Invincible Body Academy” – What if there was an online community where you could ask questions directly to Rick Kaselj and his team of health and fitness experts? What if you could also have access to Rick’s workout blueprints, his entire proprietary exercise library, tons of handouts and extra manuals, be part of his VIP coaching group, get video interviews with Rick and his team of experts, and lots more? If you add the 3 FREE DVDs to your order right now. You will get free access to Rick’s “Invincible Body Academy” for 14 days. After the 14-day trial period, you’ll continue to have access to the Invincible Body Academy, with new modules, content, interviews, workouts, and more, available to you every month, all for a small monthly investment of just $47. To avoid credit card charges, you can cancel your access before the end of your 14-day free trial period by emailing us at support@exercisesforinjuries.com and we will process your request, no questions asked. All I ask is that you help me with the shipping and handling cost for the 3 DVDs I’m going to ship to your house - it’s just $7.95. and I only pay $7.95 for shipping and handling. No thanks. I understand that after I leave this page, this offer will never be made available to me again at any price, even if I wish to pay more. I will pass on this forever.